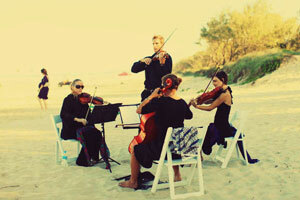 Byron Strings, Byron Bay's leading string quartet for weddings, have been playing together on the North Coast of NSW for many years at both public and private events. We have a superb repertoire of wedding music for string quartet and string trio that will impress even your most discerning guests. Byron Strings specialise in beautiful traditional and classical music through to modern popular and rock. 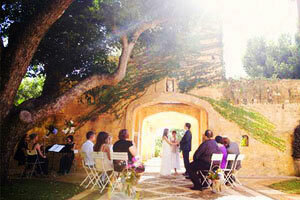 Byron Strings is available for your Byron Bay, Lismore, Ballina and Gold Coast wedding. From the most refined music for your wedding or ceremony, we are able to move with the mood of your day. Our "cocktails and canapes" set is the perfect accompaniment to your celebrations and can be tailored just to your tastes. Later on we can entertain your guests long into the night with our more up-beat arrangements of modern songs. They are all definite crowd pleasers! Choose from our wedding music playlists or create your own! Byron String Quartet and Trio, also known as The byron baROCK quartet, has performed the last two years at the Splendour in the Grass Festival, toured with Angus and Julia Stone, shared the stage with Tex Perkins, Sarah Blasko and many more. All members of Byron Strings are professional musicians with each over 15 years experience in event performance. Invite Byron Strings string quartet to play at your function or special event.